Pottery is something that I’ve developed a craving for in the last few years. There is something very earthy about pottery that appeals to me. I love the weight of it. I love the silkiness of the glazes and the fantastic colour-bombs produced on Raku. Whether it’s an uber-useful ovenproof piece or a simply flat slab with decoration to die for, I’m a total addict. 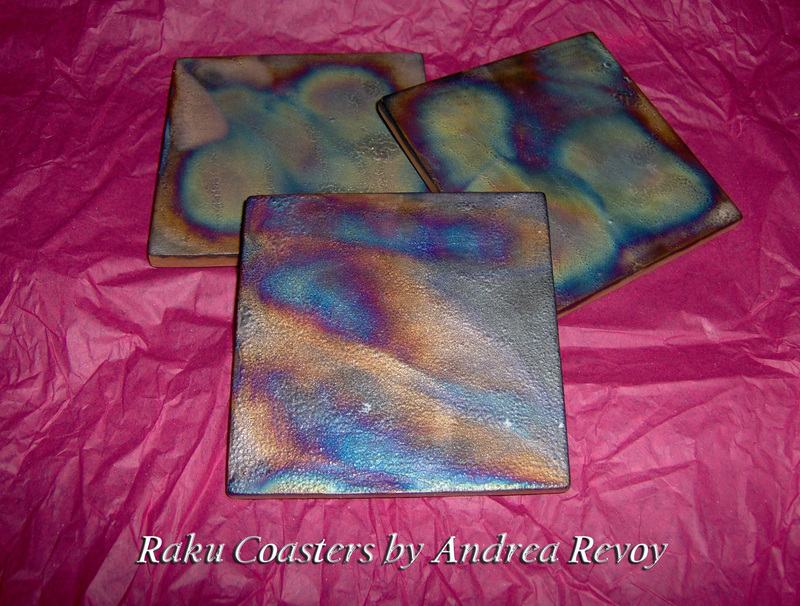 I picked up these dynamite raku coasters at the Craft Fair. They’re made by Andrea Revoy, as is the next piece. They shimmer and glow and are a million light-years away from the ugly resin ones I had. They’re lined with cork on the back and were just $2.50 each. You just CAN’T beat that deal. I also love that they were handmade locally. In my house, globalization is out and local hand-made is in. Now this. This is a dilemma. Once I realized what this was, I had to have it. I wanted more. They didn’t have more. Hence, the dilemma. Do I keep it or do I give it to someone I know would LOVE it as a gift? 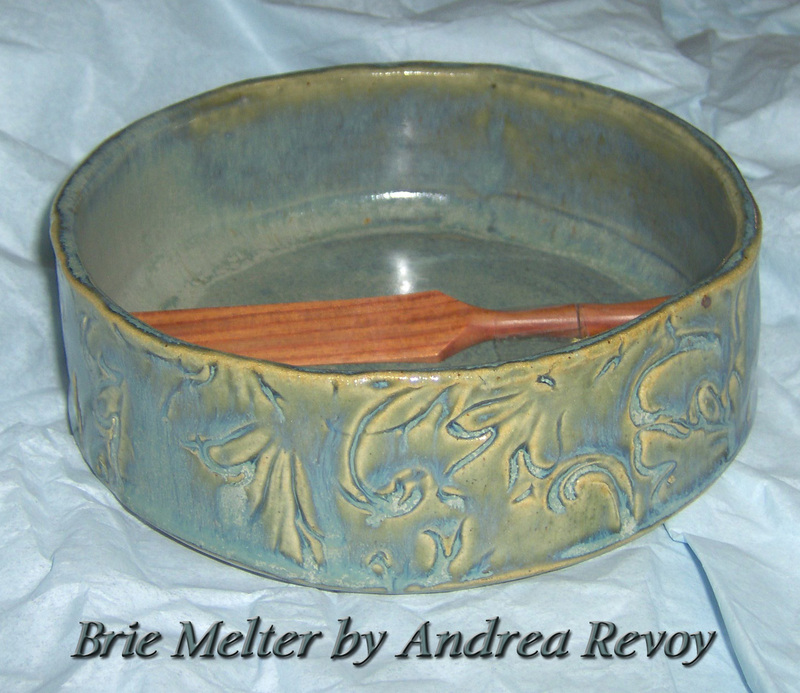 While it may look like a rather unassuming but very pretty dish, what it really IS is a Brie Melter. Yes. A Brie Melter. Have you had melted Brie? If you have, you’ll know what I’m talking about….if you haven’t, you simply must. Pop a wheel or wedge of brie into your oven (the cheap stuff actually works best) and bake it at 350 F for 8 to 10 minutes or until it’s soft and melty inside. Serve it on crustini or crackers with some bruschetta or antipasto or on sliced pears drizzled with Truscott honey and roasted pine nuts. To. Die. For. This little beauty even has a lovely wooden spatula for cutting and spreading the brie. So…my dilemma. Keep or give. Decisions, decisions……. © J. MacDonald and Just Make A Mess, 2010. Unauthorized use and/or duplication of this material without express and written permission from this blog’s author and/or owner is strictly prohibited. Excerpts and links may be used, provided that full and clear credit is given to J. MacDonald and justmakeamess.wordpress.com with appropriate and specific direction to the original content.